In 2001 I started a blog, except it wasn’t called blogging back then. It was an online diary and I kept a pretty low profile though I had some very wonderful online friends. I wrote about my heartbreak, my friends and my jobs. I was no stranger to putting things out there because before all that, I had kept up a self-published ‘zine for years before that where I drew comics, wrote about my crappy job and my favorite recipes. Then in 2005 I discovered Chocolate and Zucchini and I decided that I wanted to write about food too! So Everybody Likes Sandwiches was born and I didn’t even have a camera for the first few months. It’s managed grown up into a lovely and beautiful little darling (it’s my baby, how can I think otherwise?). Six years is pretty elderly in the blog world, but I think I’ve carved out a unique little space and I’m so happy that it’s grown and blossomed into something that people can relate to and share. Really, you have no idea how giddy and surprised I get whenever I get comments or when one of you tells me that one of my recipes has become one of your favorites too. Or how you’ve held my hand when it’s been rough. So thank you, I couldn’t have lasted six long years without your kindness. I’m celebrating without fanfare or a fancy, complicated meal. But trust me when I say that I’m not ripping you off with a salad post. This is a very worthy recipe and has become my new favorite and I’m sure it will become one of yours too. Let me introduce this humdinger of a carrot salad that I spotted on Orangette. It might seem plain – just carrots and a garlicy lemon dressing, but don’t underestimate the power of this salad. 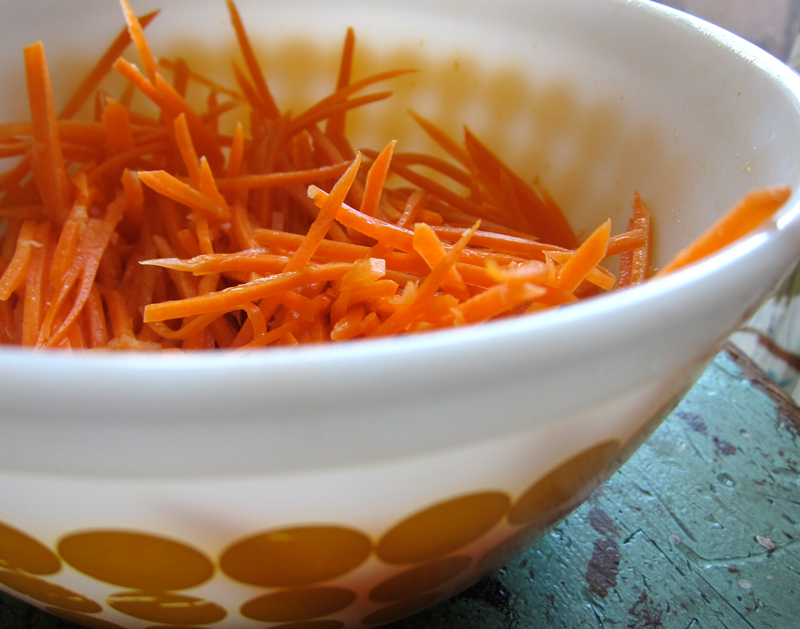 The secret is julienning the carrots – turning them into fine matchsticks. I used my Japanese mandoline, but you could certainly show off those knife skills of yours and do it by hand. A julienne peeler will do the work nicely too. Or you could even slice the carrots into ribbons using a plain old vegetable peeler. Trust me, it’s worth it. 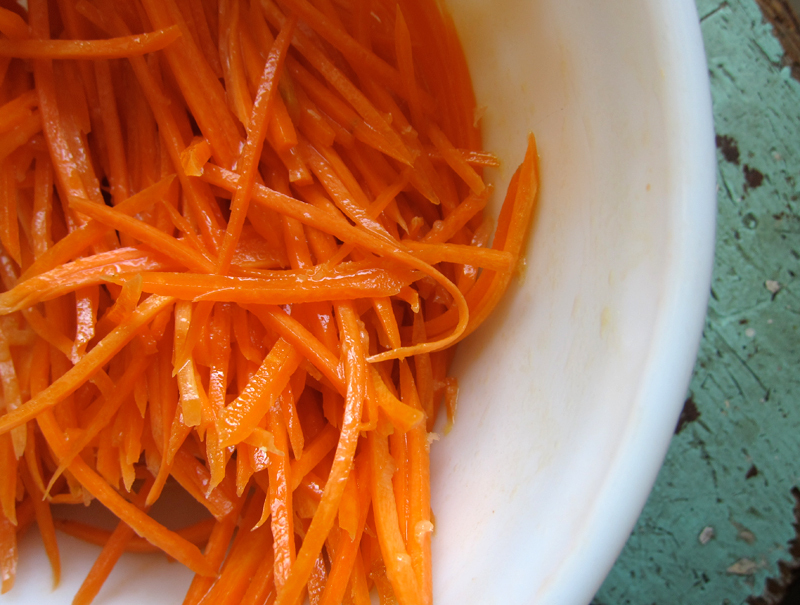 Use a julienne peeler , a Japanese mandoline , or get really serious about your knife skills to julienne these carrots. Add them to a bowl, add the remaining ingredients and mix until everything is coated. This salad will last a day or two if you don’t eat it up immediately. Happy Anniversary to you indeed! This sounds so lovely and fresh. I think I will try it and add some mint I have wilting in my crisper. And thanks for all the recipes. Your pizza dough is in my permanent repertoire. Congratulations on six years of blogging! I’m surprised at how many of us started that year (April 25, 2005 for me). OH my this looks heavenly!! And Happy Anniversary to you!! (and happy birthday to me!!) It is now too late to include this in my birthday dinner but I am sure it will make it into our dinner meal before the week is out!! Especially since our middlest has surgery on his foot tomorrow, meaning he will be home for the rest of the week, and he LOVES fine food! Congratulations and know that your time and effort is greatly appreciated!! Happy anniversary! I can’t say I often think of eating raw carrots for some reason, but this salad looks so shiny and bright that I’m tempted to give it a try! Holy 6 years! Congrats and please keep it up! I love coming to your blog! Happy Anniversary! Your recipes make it on to our table every week. I’ve even got my mom hooked on your blog and she barely knows how to operate the computer! Happy anniversary! Here’s to many, many more years! Happy anniversary! Thanks for the many recipes. .
table….Sweet & Sour Marmalade Chicken. OH!SO!VERY!GOOD! I am definitely going to be searching through your recipe files to pick up the six years I have missed. Happy Anniversary and hope for at least six more. Thank you from the Pacific Northwest USA. Bon anniversaire to you and your blog! What a great story. I once kept an online journal too. Ah, the internet. I’m glad you’re here! I’ve only found your writing recently but I’m looking forward to more! I’m not sure that I have ever commented on here before, but I’ve been reading for a good while now (definitely a year or so!) and love the way you have of making recipes simple and so, so delicious. I keep coming back to your broccoli crunch slaw and your lime and feta slaw, they’re two of my favorite salads. (I particularly enjoy adding a little sriracha to the lime and feta slaw.) Happy blog anniversary! Ripping us off? I would never even suspect it! THis sounds delicious. Thanks so much for inspiring me SO MUCH these past few years. I always love coming here. Simplicity rules. Happy anniversary! You have a carved out a unique space here. It’s very inviting. Btw…I was had my own self published zine back in the day. It was all about typography. So I guess blogging is a natural evolution for us old school zine folk. Happy Anniversary! I’ve been reading your blog since ’07, I love it. Checking out what’s cookin’ on this blog has become part of my routine each week. Happy Anniversary, Jeanette! I love your blog and feel a real kinship with you with our tastes in food. Blogging so regularly is hard, but you make it seem so effortless. Happy Anniversary! I’ve been a long-time reader who adores your recipes. Happy Anniversary! Six years is a lifetime in internet years! Lovely recipe..carrots just work so well this time of year.. I have had Molly’s carrot salad bookmarked for, well, probably since she first posted it. Now that I see such an emphatic recommendation, the recipe must come out of storage. I wonder how many people will help you celebrate your sixth(!!) blog anniversary by making this salad? At least one! I figured a big anniversary like this deserved for me to quit ‘lurking’ and wish you a big Congrats! Love your blog. Happy Anniversary dear!Its really nice to know that you are around for such a long time.Well,I’m a very novice blogger and I have my 1st Anniversary tomorrow! :)I’ve been following you for quite some time now and really enjoy reading your posts! Happy anniversary! I come here quite often but I don’t think I’ve left any message yet. As today is a special occasion, I wanted to thank you for sharing all your great recipes with us. PS: My blog did 4 years yesterday, I’m so happy I decided to start it! Happy Anniversary and thank you, thank you, thank you for the delicious recipes in my inbox! I have carrots in the crisper and plan to make this lovely salad tonight. Happy anniversary! Thank you for all of the inspiring recipes that you post. This carrot salad is right up my alley. Beautiful, simple and delicious. Thanks too for reaching out to other bloggers with some helpful advice (like when their url is messed up, or their email link goes to a blank page!) and words of encouragement. It means a lot! Emvandee, so glad to hear it! And yes, add the mint, I’m sure it would be lovely. Kalyn, I really do think that 2005 was the real push of the blog! Thank you and congrats to you too! Well, happy birthday Peggy! So glad you’re cooking away at my recipes. I love that. Rowdy, that shocks me a little 😉 I love raw carrots and they go so nicely in this salad. Crunch to the max! Jabba, I love hearing that. Whooo! And thanks for spreading the word too. Thank you, Stephanie & Sage! Pat, I love that you’re really digging into this site, thrills me!! And we’re neighbours too! Merci, Kimberley! I know, the internet is really amazing. I love it. Kelly, thanks for coming out of the woodwork to say hi. There’s never anything wrong with sriracha! Joanne, glad you feel that way. I love salads, but I hope others don’t get sick of them! I’m sure I’ll post a cake or a treat soon enough. That’s totally my motto, Tracy. Love the zine connection! I think zines and blogs are so nicely connected and I’m always amazed that there are so many new zines around. Nice to see! I love to hear that Brenda – I love that you’re jiving with my food tastes. Thank you, thank you!! It certainly seems that way, RMW! Heather, well, then you must give it a try. It’s soooo good. I’ve been dreaming about it all week – no kidding. It’s that good. Tricia, thanks for commenting! It’s easy to lurk I love when you can put out your feelers and get a response. It’s what I love so much about blogging. Thank you Irene for stepping out from the shadows and saying hello. And congrats on 4 years!! It’s a big achievement! Susan, I hope you love the salad as much as I do! Aw, your comment means so much! Thank you! Happy Anniversary! It has been a real pleasure to read your blog over the years! I can’t believe I have been reading it since early 2006. Seems so long ago! I love the simplicity of this salad…and it sure looks pretty too! Who doesn’t like bright orange! It was my favorite colour when I was a kid. Happy 6 years! I can’t wait to try this salad…looks like it’d be great for packing in my lunch! Happy anniversary! I’ve been blogging about as long, since 2003. Time flies when you’re having fun, eh? That salad looks great. I’ve made a similar one, just grating the carrots so not as pretty, but adding some fresh chopped cilantro. Yum! My new favorite salad is just about any good fresh vegetable, sliced prettily, topped with olive oil, lemon juice and salt. Did this last night with oranges, olives and onions too. Sometimes the simplest recipes are the best… and this one looks really simple (and really good). Thank you, and happy anniversary. Happy blogoversary to one of my favorite corners of the blogosphere -ELS! I think I’ve been reading for five years, so, yeah, a fan. Happy anniversary! I’ve been following your blog for a few years and just wanted you to know how much I appreciate the work you put into it. Your writing, photos and recipes keep me coming back for more, and several of your recipes including the pasta e fagioli and World’s Easiest Cake are in my regular rotation now. And as a fellow YVR girl, I love it when you have local references and ingredients. Congrats and can’t wait to see what the next 6 years will bring! Not only does this sound delicious, your photos make it look fabulous too! Thanks for what everybody likes sandwiches adds to my life! Yay, hag, so glad you’ve been reading along all these years. Whitney, this is the perfect lunch packing salad – it will stay crisp! Ellen, hooray for all that blogging! Thanks for sharing and I love your idea with oranges. Thanks, homegrown! I agree about simple being best. Aw, shucks, thanks so much Aimee! Nancy, so glad you’ve garnered a few favorites here! Thank you! Isabel, thank you so much. Seeing that fresh bright salad makes me want to get my knife skills up to par. Ooh, I was just wondering what veg I could have with lunch, and I have purple carrots in the fridge…I may be eating this in the next ten minutes. Happy Anniversary 🙂 you started your blog in 2001 and you still maintaing it which is such and inspiration. I started my blog Jan this year and I am enjoying it a lot. I am so happy to find your blog, there is so much to learn from you 🙂 Will visit regularly. Yum – perfect wintry day salad! And CONGRATS!! So glad you decided to take up blogging!! I made this salad to have with my supper tonight and it was absolutely delicious. Thanks so much for posting it! A (slightly belated) Happy Anniversary to you! 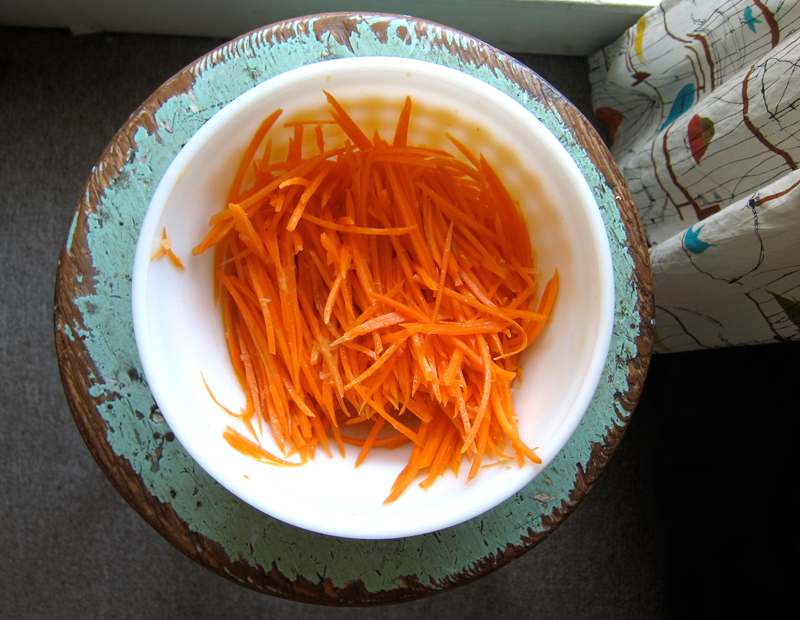 I would think of 6 years in blogging as being not elderly so much as stately 🙂 I make a similar-ish salad with strips of carrot plus mint and lime and it rocks (as, I have no doubt, does this one) – proof that simple is almost always best. Brittany, nothing wrong with chicken teriyaki for leftovers! I definitely have to go back and make that recipe again – such a favorite! Eileen, this would be extra pretty with different coloured carrots! Enjoy. So glad you found this blog, Bijoux! I love my mandoline, but I also just bought my mandoline peeler and I love it too (and it’s so much easier and less scary to use). Kankana – this blog was started in 2005 but I’ve kept a web presence since 2001 with various other journals. Thanks for visiting! Nic, so glad you enjoyed the salad – it’s such a good one! Ha, I love how you put it, Daily Spud. Thank you for making me feel more stately! Ah, a mandolin peeler. I have to Google that and see what it looks like. Maybe I can get one of those instead if they cost less. Thanks! Bijoux, I link to the peeler in the post! Take a peek – it’s a pretty useful tool. It’s a bit thinner, but still great. Happy Anniversary! Your blog has been such an inspriration for me! I’ve only been writing for one month, and I hope someday to reach the 6 year milestone too! 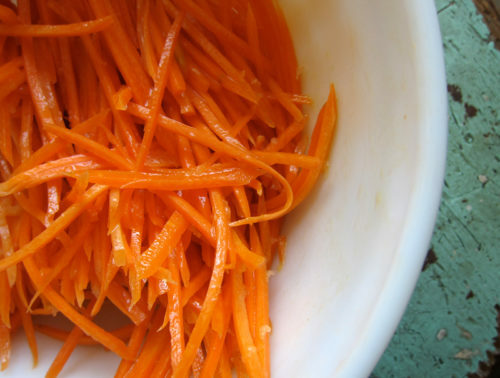 Love your photos, and this carrot salad looks divine. Thanks so much, Renee! I love hearing from new bloggers – enjoy it! That’s neat you started with a zine! I read a few back in the day and enjoyed many of them. what was yours called? Aw, thanks so much Luisa! Hi, I have made a few recipes from this blog, and have loved them all, but I have seriously made this every other day since you posted it. It is so lovely, thank you for posting. Thanks Sean, I’ll check it out! Christie, so glad you love this salad as much as I do. I’m going through carrots like mad! Happy belated blog anniversary!! If it wasn’t for you, I don’t know if I would’ve left LJ to start a “real” blog, so thanks for starting your blog. 🙂 I love carrots and often keep them in the fridge so will have to try this out. I just discovered you through Farm Fresh to You on Facebook. I’m going to go make the beet/carrot salad and potato salad with cumin right now. I loved the movie Julie and Julia, and I love sandwiches. With your blog I can enjoy both. I can put anything between bread slices. Take care, and stay around a long time.